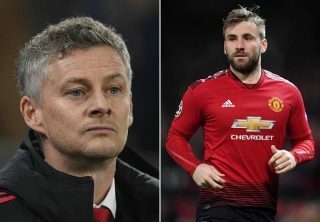 According to The Sun, Luke Shaw has held talks with Ole Gunnar Solskjaer after a series of testing weeks at Manchester United. The England left-back was left with no other choice but to pull out of the ongoing internationals with injury, meaning he could return to Manchester for recovery. Solskjaer seems an approachable coach for players who are having issues or wish to get something off their chest. He seemingly took the defeat badly as it ruins pretty much any realistic chance we had of winning silverware this season. The Sun’s source is quoted as saying: “Luke took the Wolves defeat pretty bad. Ole had a chat with him to try and pick him up. Shaw is still a young lad learning his trade and Solskjaer could be a great guardian for his progress at United. After breaking back into the United side, the former Southampton defender will now aim to get back playing for the Three Lions. Solskjaer will hope Shaw is fit and ready to take on Watford in the league for United’s next outing. We’re not well stocked at left-back.